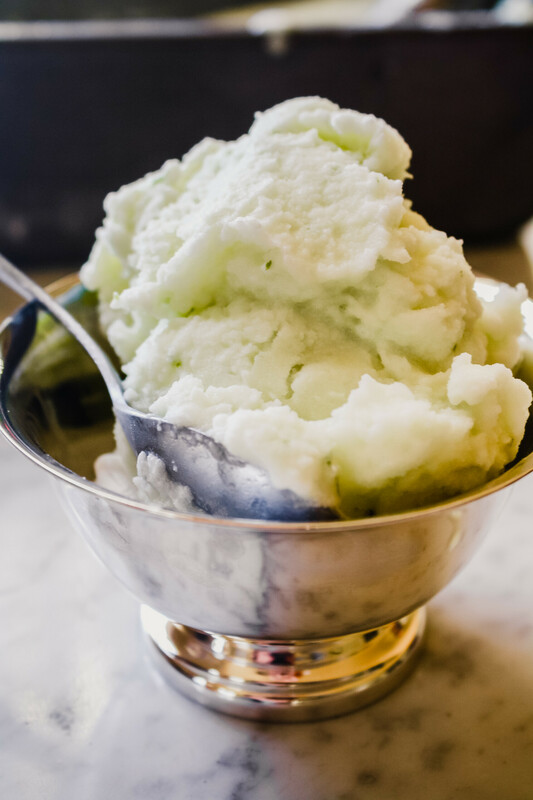 This homemade honeydew sorbet is the perfect fruit dessert for the season! 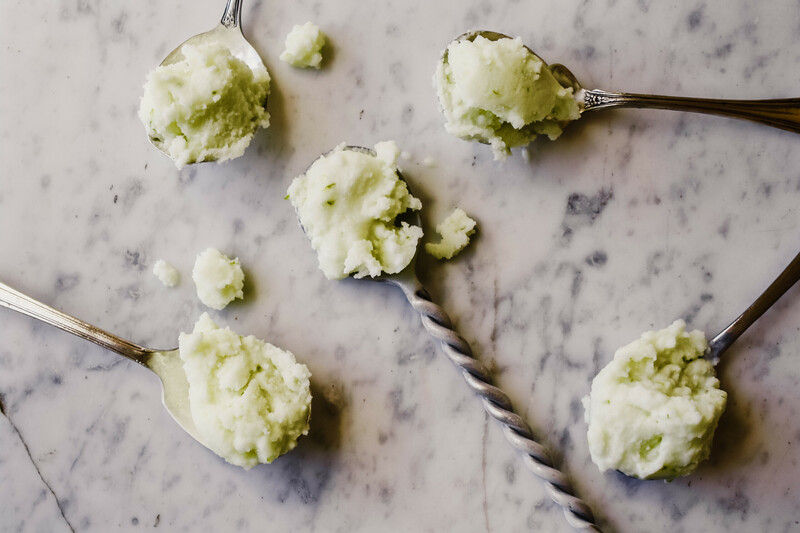 Full of seasonal flavors, this sorbet is made with mint, lime, and ripe honeydew melon. Just a touch of cream goes a long way in this cool dessert to create a luxurious texture while the tequila helps keep it soft in the freezer. This melon sorbet is enough for an elegant dinner, yet simple enough for an anytime pick-me-up, it’s sure to impress! 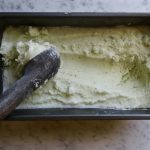 Homemade ice cream gets a bad rep for being too labor intensive and time consuming; but I promise that this recipe will change the way you view homemade ice cream, sherbets, and sorbets. If I have the room, I like to keep the freezer bowl in my freezer for the duration of the summer. That way, when I get a hankering for something cool and sweet, I’ve got everything ready! 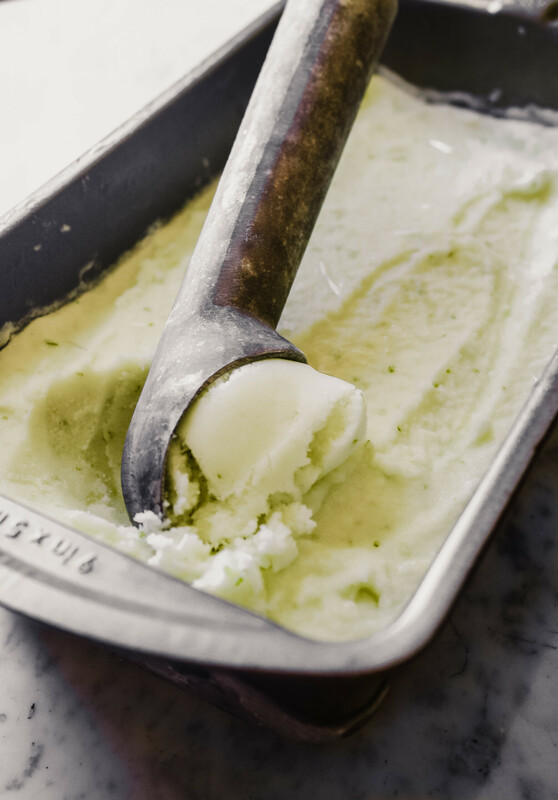 Once you have the equipment needed, honeydew sorbet is unbelievably easy to whip up. This recipe in particular takes 5 hours total; most of due to chilling and freezing. Hands-on time for this recipe is only 10 minutes, if that tells you anything about how easy it is! purée melon, zest, juice, salt and syrup. Another great thing about this recipe is that it is so versatile. Don’t like honeydew melon? Would rather use mango or use basil instead of mint? No problem! As long as the base stays the same and the amounts aren’t altered you can make your own variations. Why is there tequila in this melon sorbet? As you probably know, alcohol won’t freeze when stored in your freezer at home. 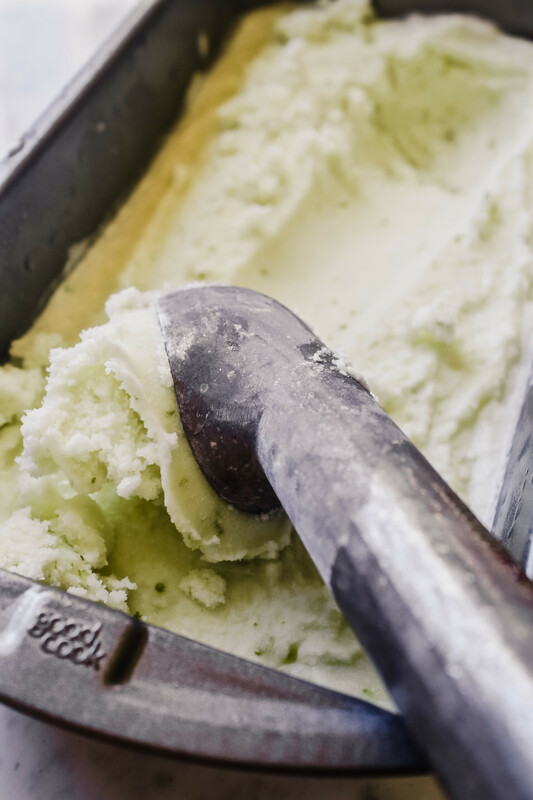 Alcohol has a lower freezing point than water, which makes it a great addition to ice creams and sorbets. Here I use just 2 tablespoons of tequila because it pairs well with the lime and mint. But you can also use any alcohol you prefer such as vodka, rum or gin. 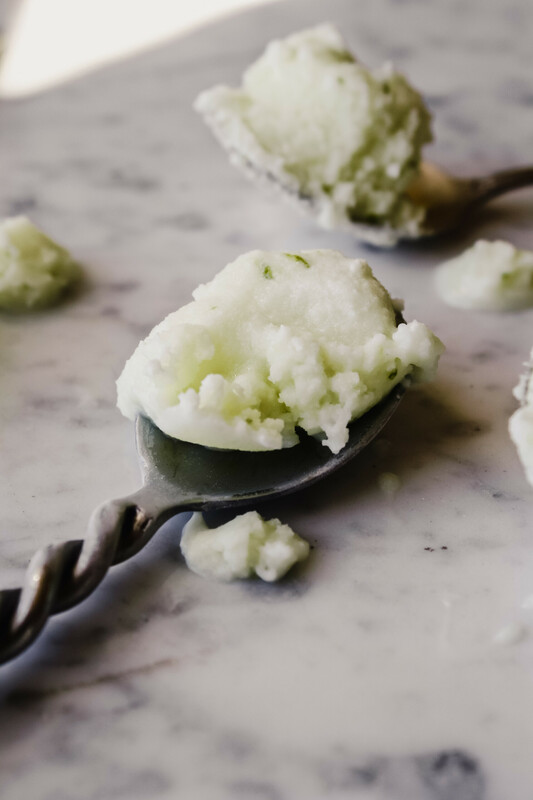 Light, refreshing and packed with flavors of mint and lime, this easy honeydew sorbet is a winner! In a small saucepan, bring sugar and water to a boil, stirring until sugar has dissolved. Turn off heat and add mint; steep for 15 minutes. Strain syrup through a fine-mesh sieve into a small bowl; discard mint solids. Refrigerate mint syrup until cold, 15-20 minutes. Purée melon, lime zest, lime juice, salt, and mint syrup until smooth, in a blender. Transfer to a large bowl and stir in cream and tequila; cover and refrigerate for 2 hours. 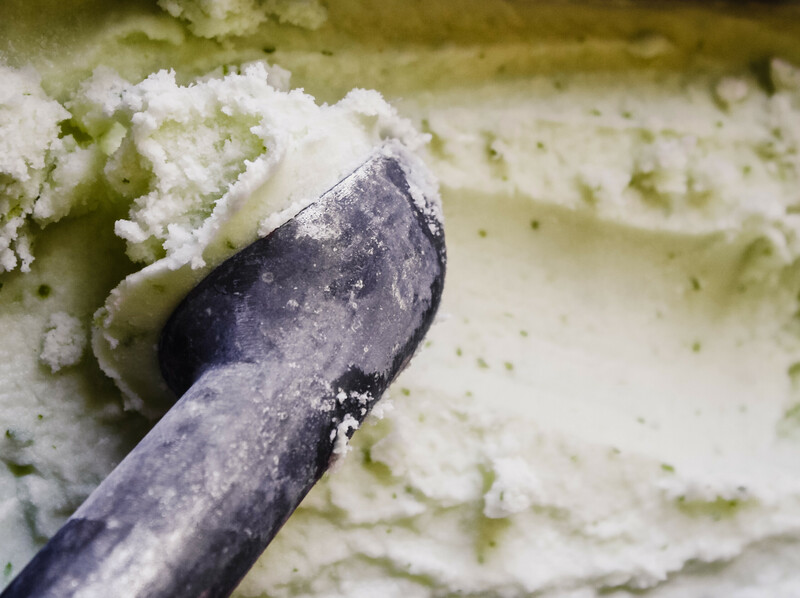 Churn melon mixture in an ice cream maker according to manufacturer’s instructions. Meanwhile, chill a loaf pan in the freezer until ice cream is done churning. Transfer ice cream to chilled loaf pan, wrap in plastic wrap and foil; freeze for at least 2 hours. Sherbet will keep for up to two weeks, but avoid thawing and refreezing as this creates crystals in the sherbet.